Explore Limits, with No Limits! Embrace the technology that simplify your work to next level. With the exhaustive experience in construction domain, we at Projec10 understand pain areas and hurdles in construction projects. Hence here we bring you a solution that streamlines field management and documentation processes. 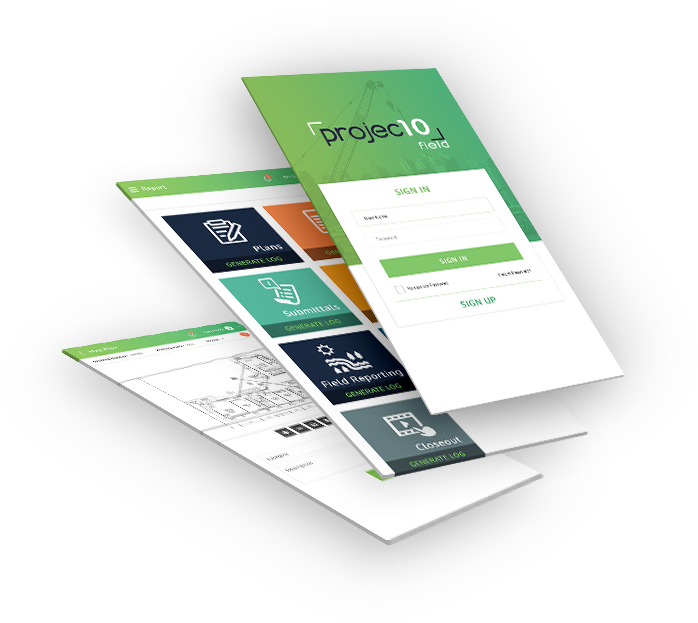 The solution Projec10 Field is an integrated field management tool that binds different roles of the jobsite. It gives real time updates, field reports, project & task status and does much more things to ease construction professionals life. Come and explore this true collaboration experience where subcontractors, owners, design team, project managers, foremen, construction workers, superintendents work effectively as a team. It's a platform built by construction professionals for construction professionals. Instantly Connect to the project time with Chat & video conference to resolve the issues on site. Make Field Reports on the job site! Create safety forms, daily reports, and weather report at your fingertips while walking on the job site. Always work on the most current set! Maintain and manage the construction documents realtime at ease without missing on any information. Edit, Markup, Share, Link, post like never before. It is never an Issue! It is a task! Create and manage task at fingertips. At one go assign task to the team members and get it completed. Download your project on your device and use all your features offline. Carry all your construction documents wherever you go.